One of our early goals is the development of Microfluidic Devices that we can directly couple to an electrospray mass spectrometer. 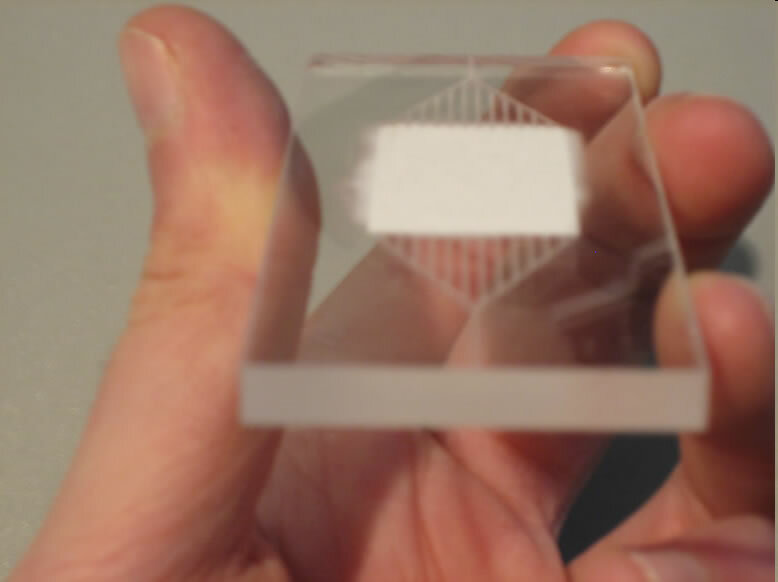 We use an exceedingly straightforward fabrication protocol because i) it's easier on us; we don't need expensive, specialized equipment, nor years of training and ii) simplified fabrication is the only way to promote 'microfluidics for the masses'! 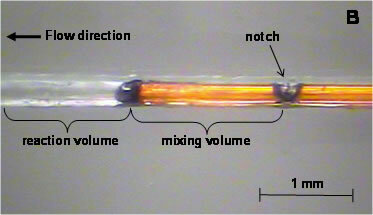 A) Our first microfluidic device! This thing is for studying millisecond time-scale kinetics by mass spectrometry. Now published in the Journal of the American Society for Mass Spectrometry. B) A closeup of the heart of our microfluidic reactor ('current mixer position' in the figure to the left). This allows for the rapid mixing of two solutions. Now this could be useful for studying a variety of reactions. One such reaction is for monitoring the rapid unfolding of proteins, where one capillary delivers protein and the other acid. Another such reaction is hydrogen-deuterium exchange (HDX), where one capillary delivers protein and the other deuterium oxide (D2O). HDX is useful as a structural reporter, as it monitors the rate at which backbone amide hydrogens exchange with deuterium. 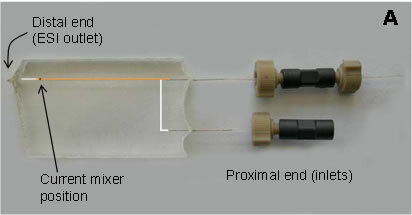 This device was further developed to house a "proteolytic chamber", where a protease could be crosslinked to agarose beads and deposited in the well. This is especially important for minitoring HDX reactions at the local level.